Initially used as a symbol of peaceful resistance against the Polish communist regime during the ‘80s, the gnome, or krasnal, has grown to become the symbol of the city of Wrocław. In fact, there are currently over 300 gnomes dotted around the city and it’s a popular tourist pastime to spot as many as possible. Poland celebrated its 100 years of independence this year – and Mr. Waldemar Plusa, together with the city of Wrocław, decided to commemorate the occasion by using their symbol in a very special way. With the intention of proving that the only limits are the ones we set in our minds, Mr. Plusa wanted to use the advanced technologies offered by local industry to make the independence celebrations unforgettable. He approached our Polish office, who were tasked with creating a 3D-printed gnome with Laser Sintering. The final goal? To launch the Wrocław gnome into the stratosphere! Firstly, Mr. Plusa delivered a plasticine model of the gnome to Materialise. We scanned the gnome to get a workable 3D file, using our Magics software suite to remove any errors in the scan and optimize it for the printer. Then we used Laser Sintering technology to print out the model. We smoothed the final model, and kept the natural white color of the polyamide material it was made from. All the gnome still needed was a rocket – which he received from the local Shortwave Club (Klub Łączności Ratunkowej) SP6ZWR, under the direction of Mr. W. Tarnowski. The first flight took place on New Year’s Eve, but the images from our intrepid gnome were slightly ruined by all the fireworks taking place around him. He was launched a second time during the beginning of January, because gnomes don’t give up easily! The second time was the charm. On this occasion, the gnome’s spaceship was able to broadcast his best wishes for Poland to the universe, through the websites of the organizers. In this way, he was the very first gnome to celebrate the Polish 100-year-anniversary in space! 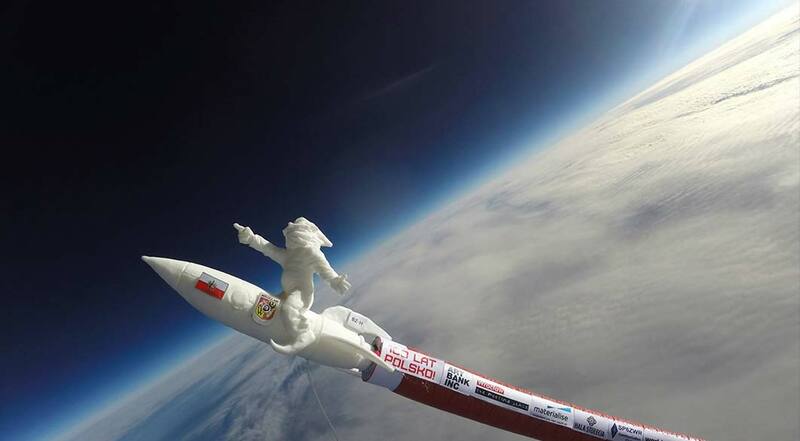 The Wrocław gnome made it all the way to the stratosphere, at an atmosphere level higher than that which commercial airlines fly at. His journey was a fitting way to commemorate 100 years of Polish independence, and symbolized the innovative spirit of the Wrocław region. Gratulacje Wrocław! Do you want to make your projects soar high with 3D Printing? Check out our Certified Manufacturing services!